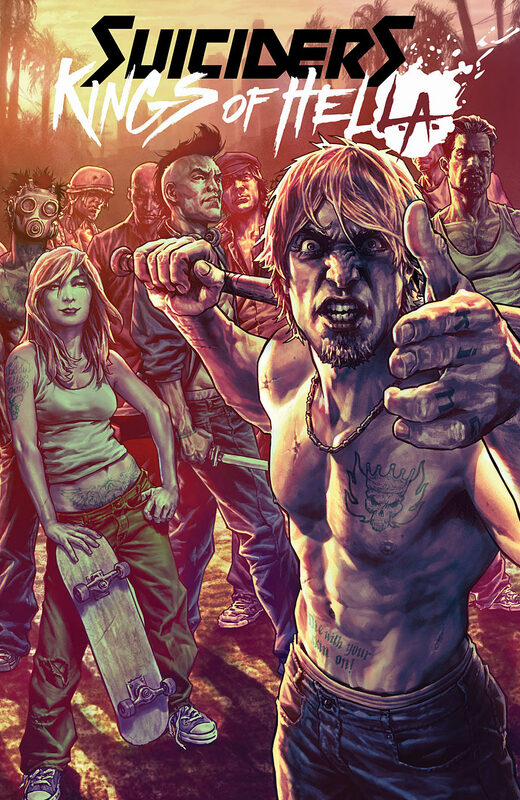 Stewart R: This Wednesday marks the return of Lee Bermejo's Suiciders in the shape and form of Suiciders: Kings of HelL.A. #1 and I cannot wait for the carnage to unfold before my eyes. Bermejo has brought on Red Lanterns and Secret Warriors artist Alessandro Vitti to illustrate this new story set some time before the events we witnessed in the opening volume and from the preview art it looks like he was certainly the right choice to depict the gangland anger and chaos! 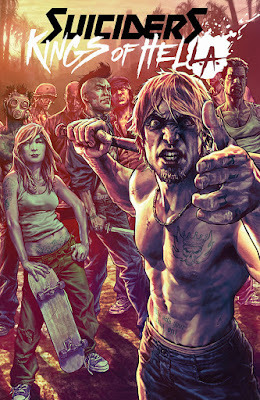 Bermejo's vision for his post-catastrophe city involves plenty of sadness and bloodshed and the brief, occasional glimpse of hope, love and kindness somewhere amongst the West Coast murk and if this is on par with that first effort then Kings of HelL.A. really could wind up being one of the series of the year. On the new book front I'm also going to be giving the debut of Power Lines #1 the once over as the premise of Jimmie Robinson's latest miniseries is certainly a contemporary one. A local street hood, living in a crime-infested ghetto stumbles across a mystical and ancient secret that bestows him with great power... that only activates itself when he's within the boundaries of an upscale white community. It's fair to say that racial tensions of all sorts are evident across this 21st Century globe, thanks to the power of the media to highlight such issues on a daily basis, and I'm certainly intrigued to see how Robinson handles the subject. Matt C: A book I'm not picking up on a regular basis is getting a place on my pull-list this week. Even though the character is a favourite of mine, I've not been properly following the adventures of Captain America since Brubaker left him behind (before that, even). Okay, so Steve Rogers doesn't currently don the star-spangled suit but the '75 Years of Captain America' celebration in Captain America: Sam Wilson #7 has piqued my interest because of the additional content, primarily a short tale written by Joss Whedon and illustrated by John Cassaday. Whedon's been away from comics for a while, getting involved in movies or something, but it'll be good to see him reteamed with his old Astonishing X-Men cohort, Cassaday. Usual suspects like Black Science and Saga help bulk up my haul on Wednesday in what is an otherwise relatively quiet week of comics for me.